The main parts / components of the chair are the cast aluminium base and frame/support and the plywood / veneer forms, including the head rest, back rest and seat. The aluminium parts are cast from aluminium ingots and recycled aluminium. The plywood / laminated forms are manufactured through steam bending of the layers of veneer. 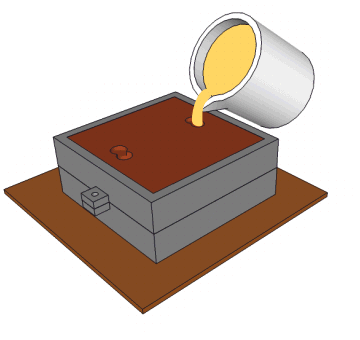 The example below shows the preparation of the casting box for the aluminium frame / support of the chair. 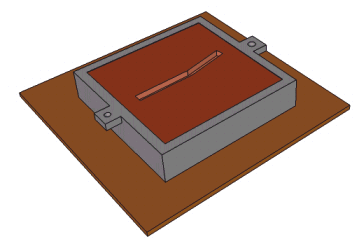 A top casting box, called a ‘cope’ is placed in position. Molten aluminium is poured into the cavity left by the wooden mould. When cool, the aluminium castings are removed from the sand. They are finished by machines such as a vertical miller and hand tools. A horizontal miller and shaping machine could also be used (vertical miller recommended).